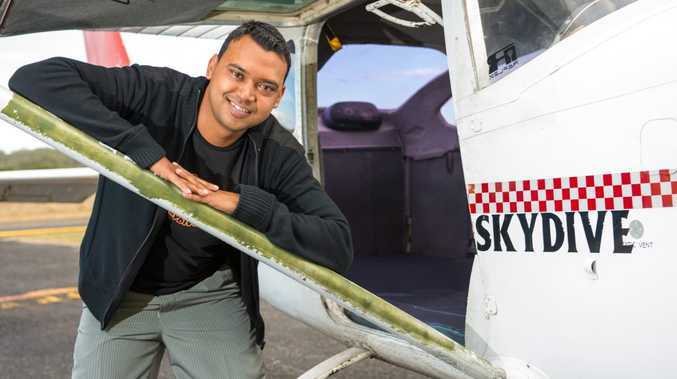 MOST people wouldn't expect nose-diving after engine failure to be a blessing, but for Coffs City Skydiving's Rav Sharma it was. The 29-year-old pilot was on a routine skydive flight on Saturday when his throttle stopped responding to inputs. Taking two first-time skydivers to 4000m to be strapped to professional skydivers and jump out of his plane turned into a potential disaster. His first thoughts were the best way to get his passengers out of the plane if possible or a forced landing without power. Adding drama, the control tower had him circle off the coast while a Qantaslink Dash 8 took off and a Tiger Airways A320 landed. "About 20 minutes into the flight I felt something happen at about 4500 feet (1500m) - a bit of fuel starvation which I thought was icing," Mr Sharma said, referring to the cold air at altitude freezing the fuel. "I still had response from the throttle which was good because I could get more height which bought me some time in the end." After climbing to 3200m, Sharma realised he had a serious problem and radioed a mayday and the tower gave him priority. Surveying beaches for a landing, he told the divers to jump. "They opened (their parachutes) high so they actually managed to get to where they were meant to," he said. He then made a decision that turned out to be exactly the right thing to do - to head back to the airport and prevent the need to recover the plane from a beach. Diving quickly not only gave Sharma more response to his control, but also let him finish his landing and taxi off the runway.